When converting motions, there are some helpers to check their quality and detect if they will be replayed correctly or if they need to be fixed and re-converted. It may happen that because the source motion frequency is for example 30fps and your Maya frequency 24fps, the animation keyframes are not exactly on Maya keyframes. Golaem will import values at each Maya keyframe, so there will be interpolation and loss of quality. You can also notice that there are blank keyframes at the end of the timeline. Adjusting the timeline to the length of the motion will make your life easier when converting it. Golaem read data in Orientation / Scale channels of the character skeleton. Depending on how your rig works, it may not transfer these data to these attributes. If your rig uses bone translations, you may need to adapt it or use some of the techniques discussed below in the Forward Kinematic Compatibility part. When importing motions, it is important to check the Forward Kinematic Animation Compatibility and Golaem Conversion Quality indicators at the top of the Motion Tab panel. This indicator checks if the translations values on bones are the same or not than in the .gcha character file you are importing the motion on. You are not using the same skeleton versions in gcha and motion files. 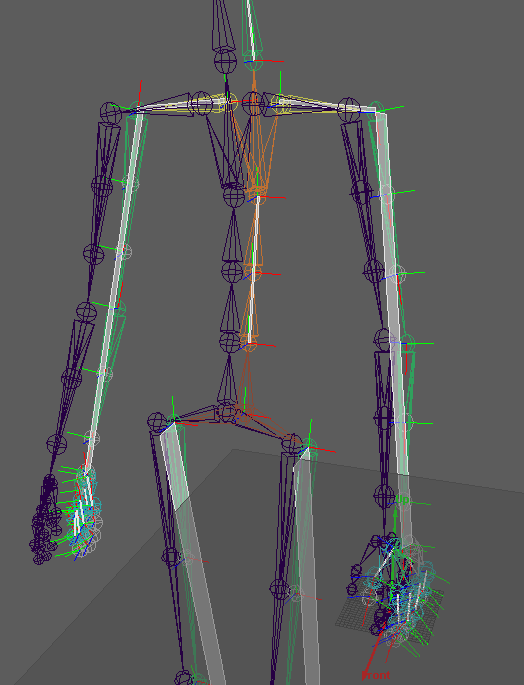 In this case reload the motion skeleton on top of you .gcha skeleton before importing. You animation is made of animated translations on bones which is not supported as-is in Golaem (except for the root bone of course). In this case you will need to fix your motion, your skeleton (check Add movable props to a character), or use a specific method to store this animation (Using blind data to store more accurate animations). 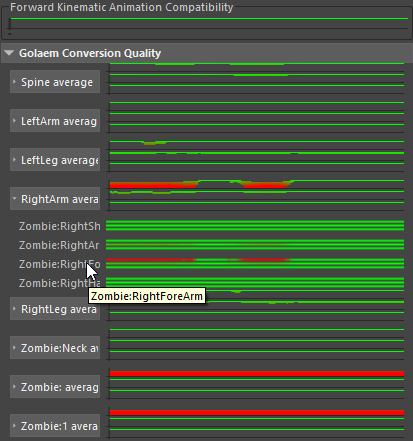 When expanded, the Golaem Conversion Quality indicator shows curves for each skeleton bones. Forward animation compatibility is bad : read the previous section again! Note that even if Conversion Quality is not perfect, your motions can still be used with Golaem. It just means that the output will be a bit different than the original animation. Sometimes it can be a problem (sliding feet, twisted limbs...), sometimes not. Use the CharacterMaker Locator to check what the consequences of the quality loss are (see below). To check motions quality, we do not care about Ragdoll Volumes or Limits, you should uncheck these. In the screenshot below, we imported a Motion and used the crop / blend parameters to make it loop (so that Golaem gradually modifies the animation in order to make the first/last frame match). You can see the difference between the converted animation and the original one. 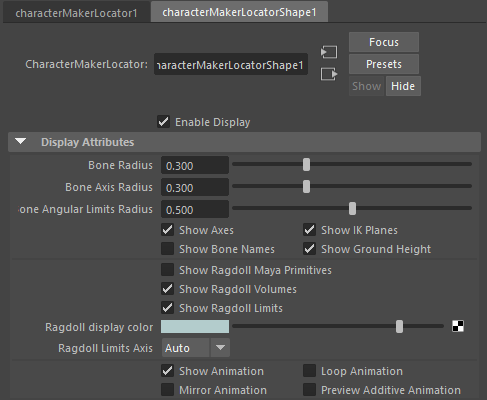 To check how your converted motion is looping, check Loop animation in the CharacterMaker Locator attributes. When you play frames outside of the frames which you imported the animation from (or cropped it to), the converted motion will loop, instead of replaying the original motion. It will enable you to check of the converted motion loops correctly or not. Note that even if a motion loops well, you may want to check that there is no drift (going straight motion), or exactly what is the turn angle (turn motion), or no change of position (static motion). See the Making your motions loop tutorial for more details about this. Another important (and even crucial) thing to check is footprints computation.